Description: Color postcard shows a group of women in a Connecticut River Valley tobacco shed. 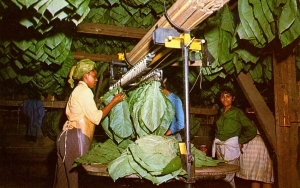 The large, freshly picked leaves are sewn in pairs onto a string attached to a wooden lath. The laths are hung in rows between the rafters of the shed. Charcoal fires or small heaters are tended constantly to ensure careful drying of the valuable crop.